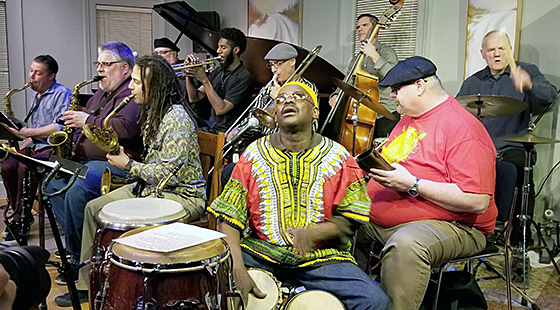 The ever-busy Planet D Nonet made a brief landing at Kerrytown Concert House in Ann Arbor on March 2 with their Sun Ra repertoire. Several Ra classics were presented: “Where Pathways Meet,” “Ancient Ethiopia,” “Love in Outer Space,” “Lanquidity” and “Kingdom of Not.” The nonet has several great soloists — like tenorist Dan Bennett, trumpeters James O’Donnell and Allen Dennard (former SEMJA scholarship winner), trombonist Tbone Paxton — but above all it is clearly a collective effort. The spirit of Sun Ra lives in the enthusiasm with which his compositions are played combining swing, bebop and more avant garde notions. TOP (from left): Dan Bennett, Justin Jozwiak, Goode Wyche III, James O’Donnell, Allen Dennard, Tbone Paxton, Akunda Hollis, Erich Nachtrab, RJ Spangler, Bob Sweet. Pianist Josef Deas not shown. 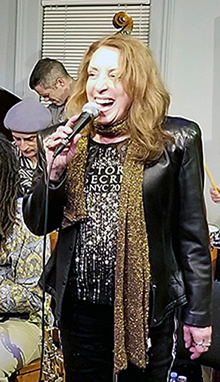 RIGHT: Vocalist Camille Price sat in for a great blues number.